Charles Dickens’s Great Expectations is, in my opinion, the greatest coming-of-age novel of the 19th century, and is without question, essential reading. This is because it, like Dickens’s other novels, is not only well written, but contains a sophisticated plot and characterisation. Great Expectations’ plot is centred on Pip, a young orphan who lives with his older sister and her blacksmith husband, Joe Gargery. At the age of seven, he encounters an escaped convict who asks Pip to bring him food and a file so that he can cut off his shackles and, out of fear, he agrees. The convict is caught, and claims to have stolen the items so that Pip does not get into trouble. One day, Pip’s uncle Pumblechook tells him to go to Satis House, and play with the wealthy Miss Havisham’s ward, Estella. Pip begins to visit regularly, and soon falls in love with Estella. He then dreams of rising above his social class so that he can obtain her love, and he hopes that Miss Havisham will enable this to happen. Months later, Pip is disappointed when she provides him with just enough money to become Joe’s apprentice. After he is apprenticed, however, a lawyer, called Mr. Jaggers, arrives at Pip’s home to tell him that he has an anonymous benefactor who has provided him with money so that he can be educated as a gentleman in London. The novel goes on to follow Pip’s journey as he attempts to achieve his ‘Great Expectations’, and the important lessons which it teaches him. 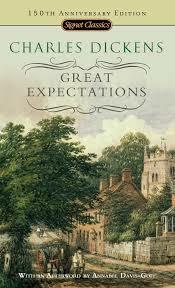 In addition to its sophisticated plot, Great Expectations is essential reading because of Dickens’ use of characterisation. Miss Havisham is characterised as the archetype of the spurned woman whose entire life has been defined by her fiancé jilting her at the altar. She refuses to move on; continuing to wear her moth-eaten wedding dress in her dilapidated home. Her greatest aim in life is to break the hearts of men, and she uses Estella to do this. She encourages Pip to love Estella, but has no intentions of enabling him to be with her: “Love her, love her, love her!” This allows the reader to see her single-minded vengeance and ruthless self-interest. On the other hand Estella is characterised as the archetype of an ice queen, and she has been raised as a tool to avenge Miss Havisham’s broken heart. Estella’s name means ‘star’, and as a result of her upbringing she becomes as distant, cold and unreachable as a star: “I have not bestowed my tenderness anywhere. I have never had any such thing.” Despite this, she is not portrayed a completely unsympathetic character. She warns Pip that she has “no heart”, and this reveals that she does not want to hurt him.